An apparent departure from the domestic dramas he is better known for, Japanese director Hirokazu Kore-eda's legal procedural nonetheless shares the same measured pacing, sensitivity to character and inquisitiveness that has distinguished his output. It sees a trio of lawyers mount a defence of a man who makes no secret of his guilt. The emphasis this time is on fathers and daughters, after Our Little Sister's exploration of sibling love and the father-son focus of After the Storm and Like Father, Like Son. 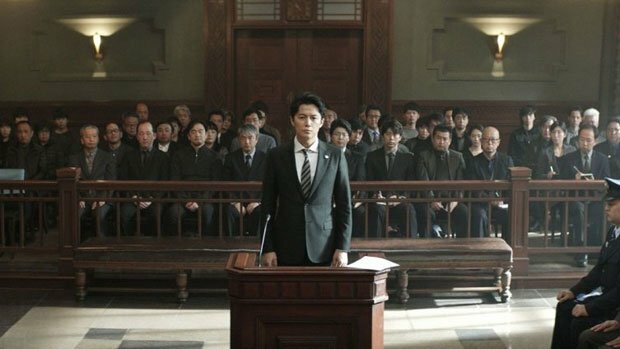 Cocky lawyer Shigemori (Masaharu Fukuyama) is looking to avoid the death penalty for his client, Misumi (Kôji Yakusho); he has already served a 30-year stretch for a previous transgression and we see him clobber and set fire to his factory boss at the outset. Despite the severity of his actions, Misumi is eerily remorseless but he's also so affable as to seem entirely harmless, and the contrary combination hooks us from the start. Shigemori and his team conduct their investigations and strategise and re-strategise, only for a more complex picture to emerge. Priding himself on remaining at an emotional remove from those he defends, as the case evolves beyond recognition and the plight of the deceased's daughter Sakie (Suzu Hirose) comes to the fore, Shigemori lets Misumi get under his skin, not least as his relationship with his own daughter troubles his mind. Kore-eda gives us a finely tuned critique of the Japanese legal system and its problematic relationship with the truth. He considers the ethical implications of presenting the most advantageous version of events, while the opposing counsel tells Shigemori, 'You're the kind of lawyer that gets in the way of criminals facing their guilt.' Eschewing easy answers, The Third Murder challenges our assumptions about how the narrative will unfold, just as its protagonist finds his expectations unsettled and expertise undermined. Probing, philosophical and endlessly intriguing, it offers a fascinating spin on a familiar subject. Selected release from Fri 23 Mar. Misumi (Yakusho) has served 30 years in prison already, but he then sets fire to his boss and seems eerily remorseless and affable about it, puzzling cocky lawyer Shigemori (Fukuyama). Kore-eda gives us a fine critique of the Japanese legal system and it’s probing, philosophical and endlessly intriguing.